“Should I roast some moong dal?” asked our cook Banu. I has recently gone and picked up lot of fish from Poonam and Sangeeta at the Khar Station fish market including a rohu for my mother. Mom prefers the rohu to its cousin caatla as the former is more lean and has less fat. I bought a whole rohu including the head. I prefer the head of caatla though as that has more juice and gheelu (brain) but a rohu head is not bad too. 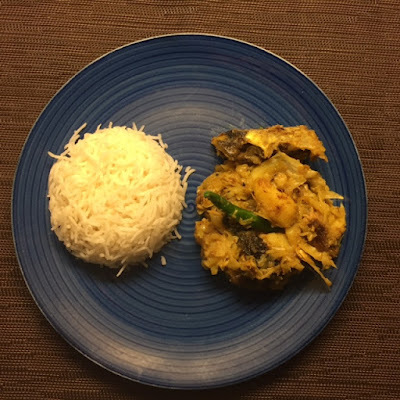 I avoid using the head of hilsa as that’s too bony and expert fish eaters like my mother can handle it with aplomb. I know where Banu was coming from. Years back I taught Banu to cook machher mudo diye daal or ‘machhi ke moondi wala dal’ as she knows it. So she must have thought that she had to make that with this fish head too. Except that this time was different. Earlier in the day, I saw small cabbages at the vegetable cart parked outside our house and bought one. There was a time when I used to make a Bengali style cabbage or badhakopir ghonto pretty often. That’s a dish that Banu just can’t get right though so we rarely have cabbage at home now. 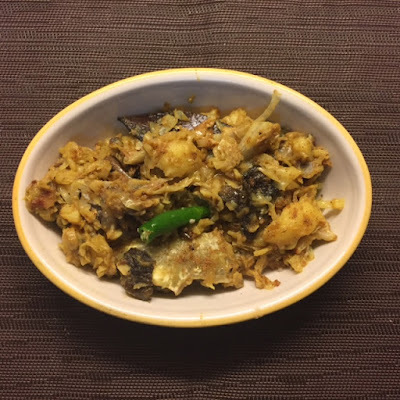 I recently had some cabbage recently at the Tejpal Auditorium Bongo Bari Pujo bhog and remembered how much I used to like the slow cooked Bengali badhakopi dish. Which is why I picked up the cabbage to cook at home. I got the idea to combine the cabbage with the fish head. I used to cook machher mudo diye badha kopi (cabbage with fish head) in the early days of my cooking. Then stopped it, as the dal with fish head took over. I remember once cooking cabbage with fish head in our first kitchen where we had a single gas cylinder connection. The gas got over mid way through the dish. This is dish that needs to be slow cooked. You can’t hurry cabbage. It is very moody after all. So I climbed on a stool that morning and brought down the electric stove that my mother in law had given us and used it to finish the dish. Thankfully we are a two gas cylinder house now. Yesterday a chef friend called up wanting to send home some food. I had to politely decline his kind offer. “I plan to cook cabbage with fish head you see,” I told him. And so I did later at night. I metaphorically shook my head and took off my (metaphoric) glasses a la Amitabh Bachchan in Hum, and entered the kitchen to cook the badhakopi with machher mudo after more than a decade. Banu had left for the day but had shredded the cabbage for me and parboiled cubed potatoes as prep. I shared the recipe through Instagram live stories. I have saved the photos and am sharing them first and the recipe below. Once the water is absorbed by the cabbage, cover the pan with a lid, reduce the flame and cook for about 20 minutes. You want the cabbage to be ‘makha makha’, stick to the pan. "Lege jawa'as a reader on instagram said. I went to the study and finished some writing while it cooked. Coming in occasionally to check the cabbage and stir it. This dish needs slow cooking as I said earlier. I had machher mudo diye badhakopi with rice and K with roti. She said, 'I just want to eat,' while I took the final photographs, but after the first bite, ‘awesome’. I was very happy with how the dish turned out too. I confess that I am my favourite cook. I can see the maccher mudo diye badha kopi returning to our kitchen. Hope you try making it as well. Hi Kalyan. Its always fun to read your post. I almost check everyday. Few of your recipes are my favourites. As far bandhakopi, it is one of the favourite veggie for dinner. Now the boasting part. as per ma who is the most finicky woman in respect of food, I make the best bandhakopi. So your post today actually brings a smile when I am in acute pain with a plastered food. Thank you so much. Let me go and make bhandakopi, as according to me food can cure any pain.